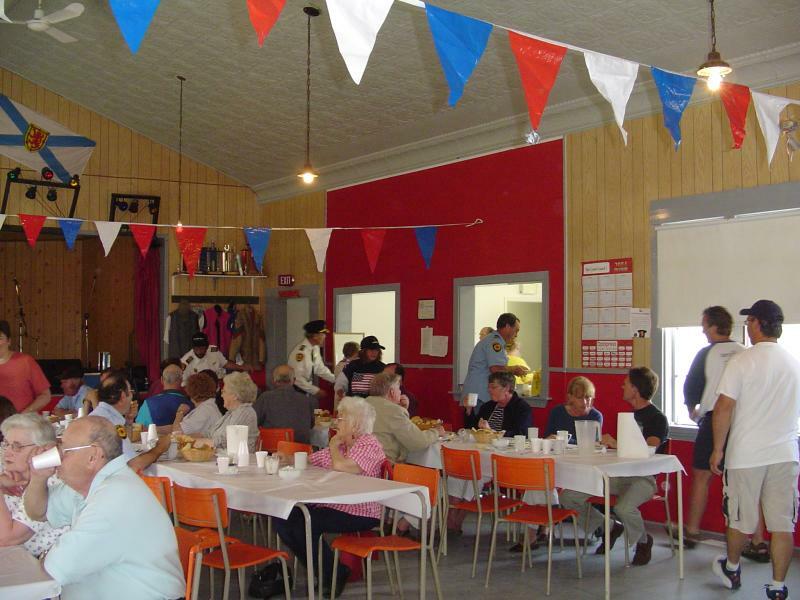 One of our local community hall suppers; this picture is taken in Ingomar at their popular chowder supper where the firemen are servers. Sand Beaches Two of Shelburne's public access sand beaches are less than 7 minutes away from Boulder Cove. Carleton Village Beach, once home to the community fish plant is now a rest stop for sun bathing seals and occasional dog walker. Great quiet beach for the kids to enjoy. Or further down the road, Roseway Beach were there is breakwater ocean swimming AND fresh water channel swimming. Good Bird Watching Beach and good surfing. Lake swimming and fishing. There are lots of places to go fresh water fishing in the Spring and Summer in Shelburne County. Don’t forget a licence. Ask about details at the office. For those who don’t like ocean swimming Dexter’s Lake is a great place to take todlers as the water is very shallow. Or the family can head to Welshtown lake where there is a municipal park with picnic tables and change rooms. Check out www.canoeshelburne.com for information on where to go canoing in Shelburne County. Fresh, local seafood Whatever is in season we can get it for you. Just ask. Lobster season is December to May. Studio 138. It's a coffee shop, an art studio, a gallery and home to the Whirligig Used Book Store. Combined, this place is a haven of artistic talent and inspiration offering art classes for all ages. Please visit their Facebook page for more details. Learn to Sail. Shelburne Harbour Yacht Club is now offering week long sailing lessons in the summer months to anyone over the age of 8. Kids, moms, dads, teenagers, everyone can learn how to sail. Courses are only $50.00 per person. There are 3 levels of courses and are instructed by Canadian Yachting Association certified and insured instructors. The courses provide an introduction to sailing theory, safety and boat handling. The course is taught in 9-foot sailing dinghies and also provides a safety boat, on-the-water instruction and learn to sail manuals. Each student receives 30 hours of instruction. To learn more please call the office at 1-866-SEA-STOP or the yacht club at 902-875-4757. Summer clases only. Golf at the River Hill Golf and Country Club. The get there the quickest head back to the highway and continue left on HWY 103 to the next exit, number 28. The course is just a few minutes off the highway. OR Hang a left out of Boulder Cove driveway and a 40 minute scenic coastal drive will get you there too.Opens in March and closes in November. Shelburne Harbour Tours. 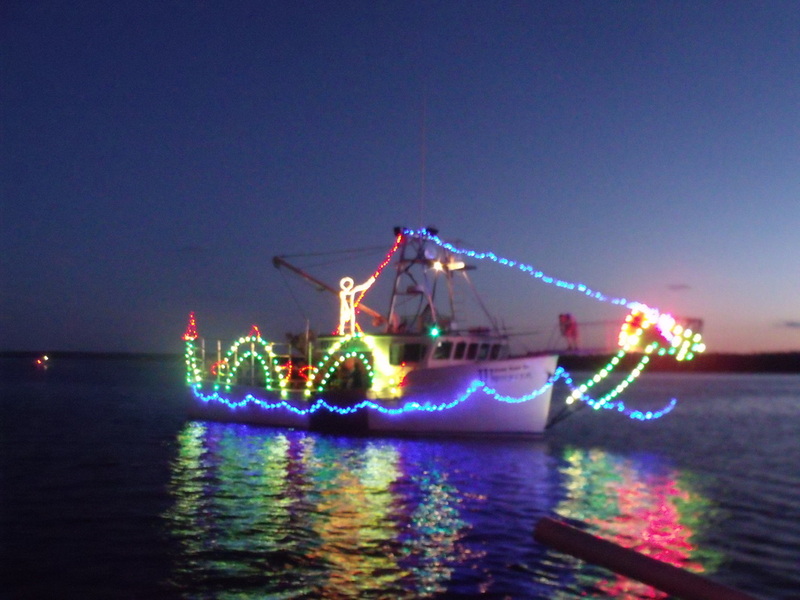 Take a boat ride up the harbour on the Brown Eyed Girl, a 44 foot Marine Trader trawler. Cost is $35 per person. For more info call 902-875-6521 or ask when you are checking in. Click here to learn more www.shelburneharbourboattours.ca Tours run from May to September. Sandy Point Lighthouse Centre. A great picnic park and at low tide visitors can walk out to the lighthouse on a sand bar. Sandy Point Lighthouse is located at the entrance of Shelburne Harbour and can be seen from Boulder Cove. The centre sells souvenirs and ice -cream and is the local community hall where the community hosts they're famous lobster suppers. Watch for dates! Historic Dock Street, Shelburne. All the shopping and museum hopping you need to fill the afternoon. Just 10 minutes from Boulder Cove. Find your roots. Many travelers learn a lot about local history when they travel but never think to look for their own history. It can be interesting and easy with the help of our local genealogical societies. You may discover that you are more of a local then you would have ever thought. Osprey Theatre. Also found on Dock Street and run by a local theatre group, the Osprey features great programing the whole family can enjoy. Ask about it when booking. Now they offer Thursday night movies! Dairy Treat. As all the children do at least once- bike to the dairy treat! Boulder Cove has the bikes and the helmets- all you need are the kids! Estimated bike time: 1 hour. Island's Park. A provincial campground and picnic park. 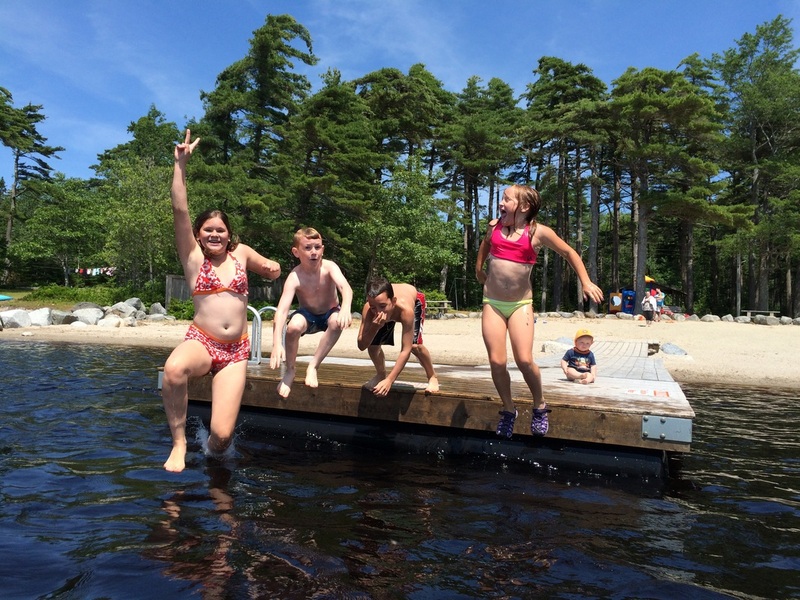 Island's Park is great for swimming because it is closer to the fresh water of the Roseway River making the ocean water warmer. The park also offers lots of picnic tables and a boat ramp. Welshtown Lake and Welkum Park. One of Shelburne's many lakes, Welkum Park is a picnic park found on Welshtown lake with a public swimming area, picnic tables and change rooms. Site seeing and coastal driving is a great way to see the county. With many lighthouses and small community museums, Boulder Cove will be happy to direct you around to all the picturesquescenery Shelburne County has to offer. Boulder Cove now offers a self guided driving tour of the shore road for those who want to learn more about the area they will be driving on. The drive ends at Baccaro Point Lighthouse. Birchtown, home of the Black Loyalist landing and Museum complex. Only in it's beginning stages of development the complex features a museum, gift shop and research centre on the Black Loyalist heritage. Town of Lockeport. Just ½ an hour away, Lockeport is a great day trip and features a the large sand beach, Crescent Beach (once featured on the fifty dollar bill ). At the beach there is a beach centre that features a gift gallery, visitor information, beach equipment rentals, showers, change rooms, ice-cream shoppe, canteen and interpretive displays. Lockeport is also offering harbour tours. Just ask at the Beach Centre. Barrington. On the other side of Boulder Cove, about a ½ hour drive, is the municipality of Barrington which features one of the greatest bird watching areas in the province, many sandy beaches and has a unique cultural all it's own. Relying heavily on the fishing industry, Barrington is a must see when traveling Shelburne County with it's Important Birding Area, fascinatingMuseum complex as well as several quaint community museums, it is sure to please the cultural traveler. In 2014 Barrington will be hosting the Darren hudson Log Rolling Camp hosted by our own World Champion Log Roller. Bird Watching. For all you birding enthusiasts and naturalists, Cape Sable Island is the place for you! Having a designated, 5 species Important Bird Area the island is a perfect place for you to explore and discover. Makes a great day trip being only 1/2 an hours drive from the cottages. Pubnico. Land of the Acadians. The Acadians were the first Europeans to live in the area – circa 1653-and their culture lives on in Pubnico. Learn all about their struggles and achievements at Le village historique acadien or do some research at Le musee acadien, archives and research centre. Thomas Raddall Provincial Park or the Kedji Seaside Adjunct in Port Mouton. Just a 40 minute drive these two parks are great for the outdoors-men and women. Great picnic parks with interpretive panels and rangers to help answer and questions you may have. Ouset-Ville Perennials rated one of the top 10 nurseries to visit by Canadian Gardening Mag. Frenchy’s! Shelburne is home to our famous Guy’s Frenchys where you get some great finds. Always busy and making bin drops every hour, Frenchys is open 7 days a week. This is just the beginning of all th activities you can do in Shelburne County! When booking your vacation with us don't forget to ask about local events. 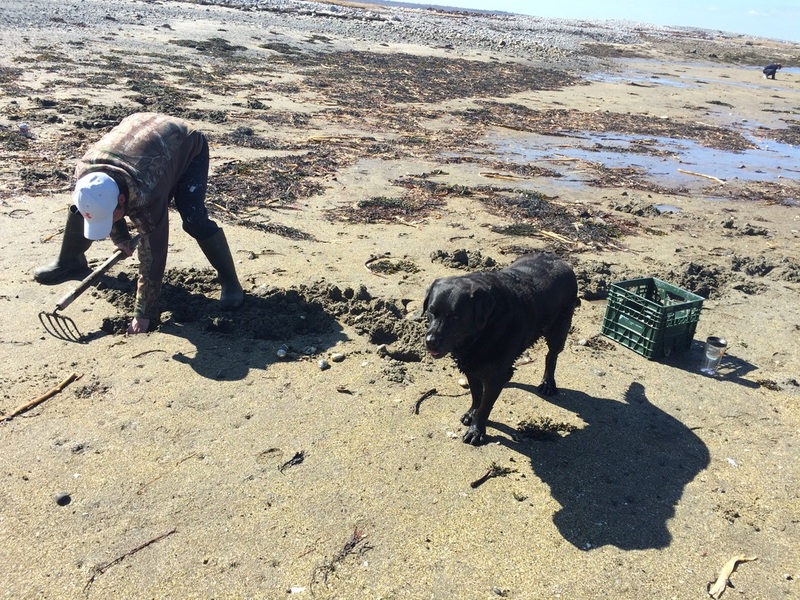 Clam digging on McNutt's at low tide ...an activity that can only be done during the months with the letter R in them.